How adorable is this? 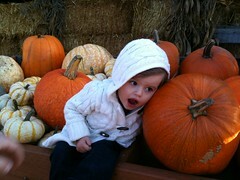 Taking advantage of beautiful fall weather, we took Cate and Jane to the pumpkin patch yesterday. And Cate liked the rocks on the gravel road beside the pumpkin patch infinitely more than the pumpkins. Still, a fun outing.